It seems like every time I come into my kitchen there is some form of gourd on my counter. 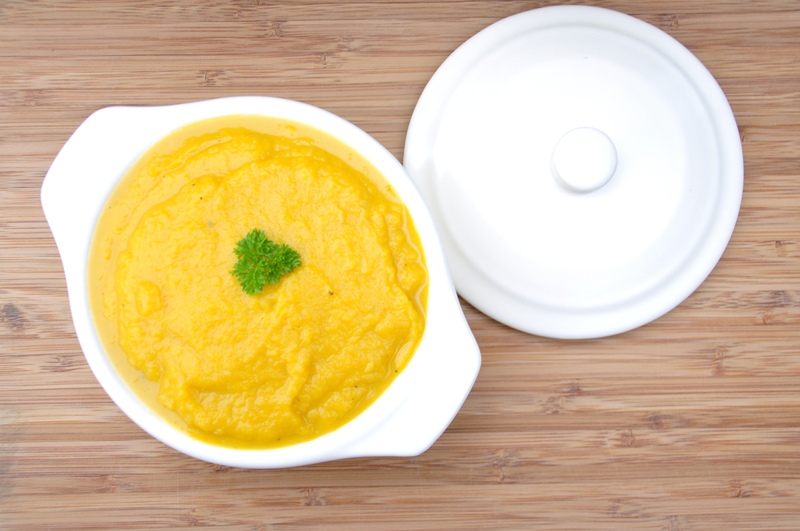 This time, it’s butternut squash. I adapted this recipe from How to Eat, changed up a few things and it was perfect! I was surprised at how thick and creamy the soup tasted because there’s absolutely no dairy in it, and there’s really not many ingredients either. This recipe serves a little over 4 people in large portions,can be served as a side or a main course and looks super appetizing. It also takes just under an hour which is pretty good considering everyone who tastes this will want more. You don’t have to be a perfectionist for this recipe when it comes to chopping things up. Everything is getting blended in the end so nobody will be able to tell! Side Note: This website is completely unrelated to this post, but I came across it this week and thought it was the funniest thing ever. If you have a good sense of humour, check out Thug Kitchen. 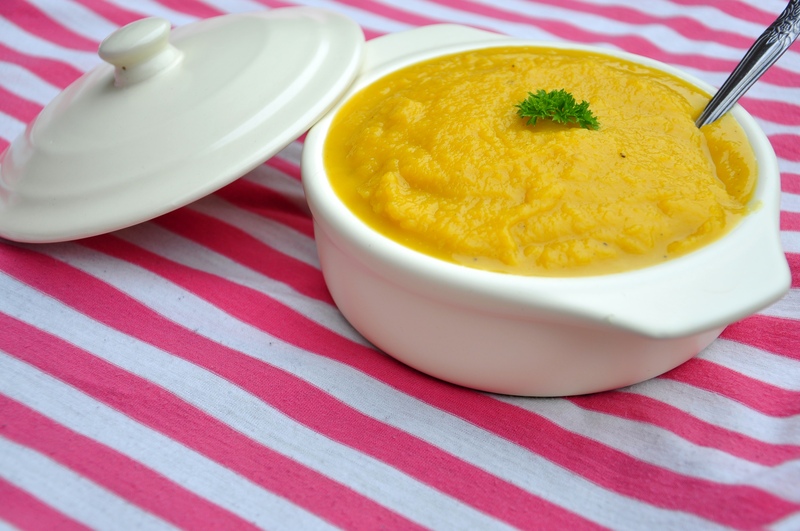 In a large bowl, coat the butternut squash cubes in 2 tbsp. of olive oil (use more if required) and evenly sprinkle a small amount of salt and a generous amount of pepper. Put the cubes on a baking sheet and bake for 25 minutes, mixing half way through. When you take them out of the oven, they should be easily pierced with a fork. In a medium-sized saucepan, heat remaining olive oil. Add onion and garlic and saute until just starting to look golden. Add the butternut squash, broth, a pinch more of black pepper and hot sauce (if you want it). Let the soup simmer for roughly 5 minutes, stirring once or twice to make sure everything is well mixed. Turn the heat off the stove, and with a hand mixer blend all the soup together until completely smooth and no chunks are left visible. 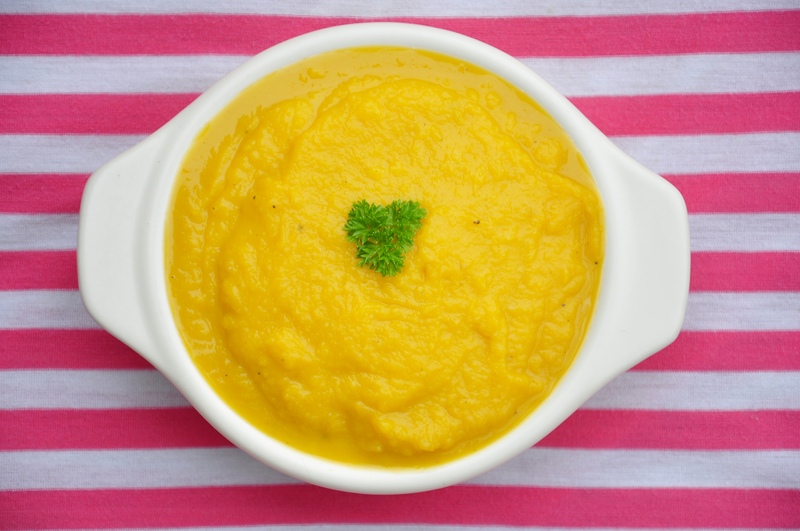 If you don’t own a hand blender, you can wait until the soup cools slightly and then use a food processor to blend the soup. Serve with fresh bread, salad, pasta or whatever you want, really. You can also keep it in the fridge for a few days and bring it for lunch as well. Isn’t butternut squash soup the best! So happy for these great autumn recipes. this soup looks fabulous! When I make mine I add on tart apple peeled and chopped to the broth and squash to give it a little zip! Well done Ronnie!